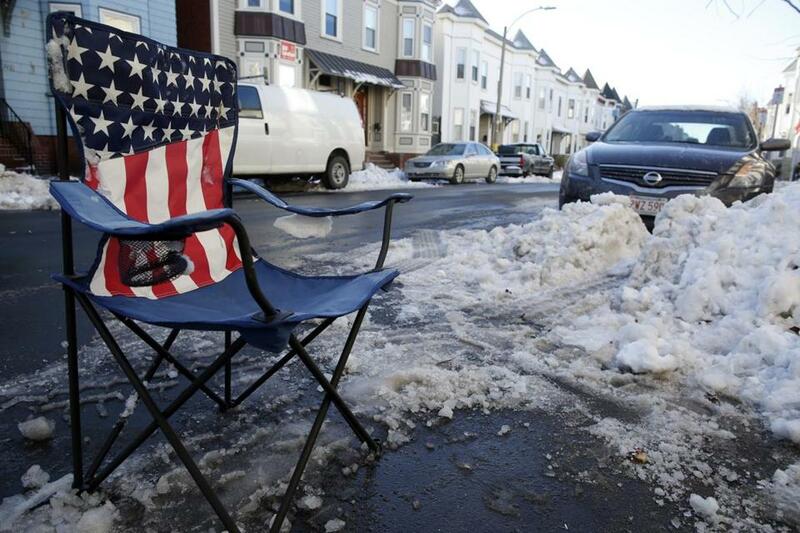 An American flag chair was used as a space saver on East 5th Street in South Boston, Massachusetts December 16, 2013. Disputes over parking in South Boston are as constant as the tide lapping the shore of Castle Island. People fight over orange cones that save shoveled spaces. They challenge tow trucks on the prowl. And drivers double park as if it were an inalienable right. Now, there’s a disagreement about an effort to curb the disagreements. City officials are preparing to launch a 90-day experiment in roughly one-third of the neighborhood that would expand resident-only overnight parking from four to seven evenings a week. The goal is to stanch the flood of out-of-town visitors who commandeer patches of pavement, thus making spots available to local residents. But some residents argue the initiative does not go far enough and are calling for radical steps in a neighborhood held hostage to parking. Some residents suggest that a decade of development has finally reached the tipping point. Others worry that the pilot parking program will make it impossible to accommodate out-of-town guests. Bill Linehan, City Council president, said the 90-day trial is an attempt to address complaints about the scarcity of parking on weekends, when an influx of young professionals now living in the neighborhood attracts droves of visitors. The initiative will be evaluated after three months, Linehan said, even as other efforts are underway to alleviate parking pressure. If the parking restrictions prove successful, they may be extended to the entire neighborhood. Right now, resident-only parking is enforced from 6 p.m. to 10 a.m. Monday through Thursday. 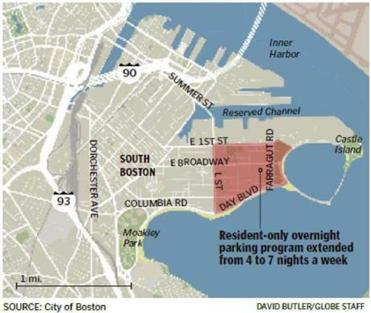 The pilot program will extend overnight resident-only parking to seven evenings a week in South Boston’s City Point neighborhood. The program, slated to start in mid-September, will cover streets east of L Street from Day Boulevard north to East First Street. Roughly 150 people jammed a neighborhood meeting last month to discuss the initiative. The reception was less than enthusiastic. In other parts of the city, seven day resident-only parking restrictions are common. Most neighborhoods in central Boston have it, including the South End, Back Bay, Beacon Hill, and North End. But Southie is Southie, where parking is a cultural phenomenon that provides more fodder for chitchat between neighbors than the weather. The neighborhood is a peninsula that has swelled with new residents, the population surging 12 percent in the last decade, according to the US Census. Single-family homes have been cut into condominiums. Builders have razed factories and warehouses to make way for gleaming developments. The number of resident parking stickers has increased by 10 percent in the last three years, jumping to nearly 18,258 from 16,636 in 2011, according to the city Transportation Department. When the resident parking program began a dozen years ago, South Boston denizens and elected officials did not want resident parking restrictions on weekends, according to city officials. To prepare for the pilot program, transportation officials will modify signs to make it clear that overnight parking is for residents only, seven nights a week. To increase supply, the Transportation Department is working on a plan to add angle parking on Farragut Road, which will create more spots than what parallel parking provides. Other ideas include angle parking on sections of Columbia Road. Some residents have suggested making more streets one way to allow for angle parking on one side of the road. McDevitt proposed a fee for parking stickers — there currently is no charge — to raise money for stepped-up enforcement. The city also wants to push for improved bus service and expanded bicycling. “Hopefully, in the long run, that can reduce the need for automobiles,” Gillooly said. Linehan remained optimistic that seven-day resident parking will catch on.